The Warped Lens of Perception: You know this means war, don't you! You know this means war, don't you! I texted back: Arachniphobe here... no help. Throw Rocky at it. (Rocky is her cat). On a side note - after reading the first chapter of this book on the web, it seems like it might be a good read. Dry, but good... FURTHER! 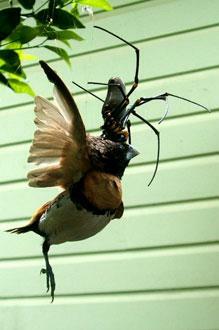 it is like having a sword and shield to battle the arachnid menace that threatens to destroy our planet. That and you can get it new for $11.55! I know she didn't ask me to come over and deal with it, but i found myself asking - "Why the hell would you ask me to deal with this thing?" Somewhere, back in the annals of time, their space-ship landed and they have just been biding their time till the day that they can invade. I just know some where out there - there is a spider the size of a Buick, like in Harry Potter! Well... I have officially given myself nightmares for the next week or so... I'm going to go sit in the tub with a baseball bat now. Wait... they come up out of the drains, too, don't they?!? I think I am going to sleep in a circle of burning gasoline for the next month or so.